Plans are being drafted for a new and larger building that could potentially replace the University of Rhode Island’s current Memorial Union. According to Bruce Hamilton, director of the Memorial Union, a preliminary design is being created for a hypothetical 220,000 square foot building to replace the 60-year-old student union. Over a year ago, the Association of College Unions International (ACUI) informed URI that the current 130,000 square foot building is not large enough for the student population. Plans were initially drawn for additions and renovations to be made to the existing building and this work was included in the five-year Capital Improvement Plan. However, upon completion of the plan this past July, leadership encouraged the development of an alternate proposal for an entirely new building. This new plan calls for similar additions as the renovation plan. “We would be adding a major multi-purpose function space, more recreational space, late-night food space, a performance studio that allows students to both perform and dance in, updated meeting rooms, smaller spaces for students to gather in smaller groups and hopefully an auditorium,” Hamilton said. The plan also calls for additional parking. In the case that a new building is approved, Hamilton said it would be located at the site of the current Union and would be constructed in multiple stages as a result. Hamilton said it will probably take another month to finish designing the new look. 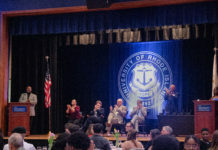 The executive leadership at URI will then decide which of the two plans will be advanced to the Rhode Island Council of Higher Education. Assuming the council supports the plan, this process, along with determining how to fund the project and all pre-construction work would take around four to five years.